Academica Summer Hostel i Helsinki, Finland: Bestill nå! Group reservations can be modified or cancelled up to 1 month prior to the arrival free of charge. Group bookings cancelled or modified later than this will result in the charge of full amount of stay. Payment is made by invoice, due date 2 weeks prior to the arrival. We will add a 6 euros invoicing fee to the invoice. The payment is non-refundable. Please provide billing details to us via email. Please provide us a rooming list with names and passport numbers in advance to make the check in process faster. ALL ROOMS have a private toilet, shower and kitchenette with a fridge. Kitchen equipment can be borrowed. Bed linen and towels are included in the room price. There is a possibility for internet connection in the rooms via cable. Part of the rooms were renovated recently. BREAKFAST is available daily for extra fee. We have parking facilities; please contact us if you wish to reserve parking for your car. Safety boxes are available in the reception and we also have a free luggage room. Free internet can be used in our common room. 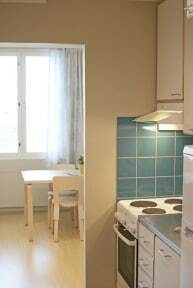 LOCATION is central; hostel is situated close to the beautiful Hietaniemi beach, Kamppi shopping mall, restaurants and sightseeing attractions. Tram and bus stops are around the corner, while the metro, train and bus stations are only a short walk away. Hostel Domus Academica is the hostel of the year 2016! Contest was organized by the Finnish Youth Hostel Federation. Read more about us from our web site.